Beginning today, Angelenos will have a chance to give “Service Props” to their favorite bartenders in a contest that will crown one lucky winner LA’s Best Bartender for 2010. From now through August 4th, Table 20 invites you to visit the Official Contest Website, nominate your favorite bartender, then encourage your friends to vote and leave comments to support your nominee. After the 30-day nomination and voting period, the top 25 vote-getters will be whittled down to five finalists and a People’s Choice winner. The judges will select a winner from these six bartenders. The top vote-getter will be named the People’s Choice winner and get an automatic spot in the finals, plus dinner for two at Tasca Wine Bar, a $50 Bar Keeper gift certificate, and a t-shirt. The six finalists will also have their profiles featured on the Table 20 and L.A. Sates blogs. 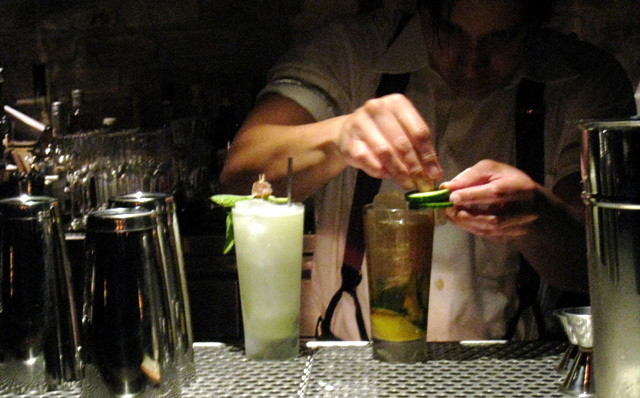 And if you think this contest is only for the bartenders, think again. By participating as a Nominator, you’ll be entered into a drawing with a chance to win a dinner for 4 at Lazy Ox Canteen, dinner for 2 at Takami Sushi & Robata Restaurant, and a pair of tickets to the post-contest party! The distinguished panel of judges includes Caroline on Crack, Food She Thought, kevinEats, Vixen’s L.A. Happy Hours, and some guy from Thirsty in LA. That’s right, I’ll be joining my esteemed colleagues to select five finalists (along with the People’s Choice finalist) and determine the overall contest winner. But wait, there’s more! There will be an end-of-contest party in August, and as a contest judge I can give away 5 invites to my readers. Each invite includes a plus 1, so you can bring a friend. Stay tuned for party and giveaway details.